The Baylor County Clerk is responsible for vital records, which are kept at the Courthouse in Seymour. These include birth and death records from 1903, marriage records from 1879, and divorce records from 1881. On line information is currently difficult to locate due to broken links. 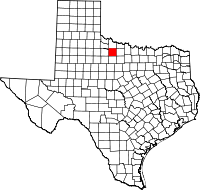 Seymour, County Seat and only town in Baylor County, was established in 1878 by settlers from Oregon. By 1880, the census shows that 78 people lived in the County. Despite the resistance of the local Comanche, Tonkawa and Wichita hunters, these white settlers primarily became ranchers; the also discouraged farmers by cutting their fences.